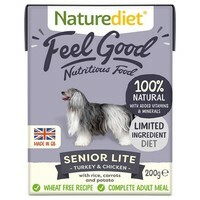 Naturediet Feel Good Senior Lite is a complete and balanced meal made from high quality cuts of lean Chicken and Turkey meat, Rice, Carrots and Potatoes. Steamed cooked to lock in all of the delicious flavours, this limited ingredient diet is the perfect nutritious meal for less active, older dogs, or those on a weight loss or management diet. Feel Good Senior Lite is appropriate for senior dogs and adult dogs requiring low calorie foods.